Are you tired of cleaning the mess on your electric or gas stovetop? Do you dream of cooking without flames that heat up the entire kitchen? Want a safer cooking alternative to your gas stove? An induction cooktop is the solution for all your gas/electric stove top cooking troubles. Is an induction safe to use? How Popular Are The Induction Cooktops? Why buy an induction cooktop? Induction cooktop gives you heat without the accompanying fire. Surprised? The cooktops help in heat creation by means of powerful electric fields. They heat food without flames or any direct heat. The most significant part of induction cooking is it is more efficient than the conventional gas and electric stovetops. And for those who are looking for a safer cooking option than the direct heat gas stove cooking, the induction is a very good option. You can even place a paper in between the cooking pan and the cooktop without the paper catching fire. Efficiency wise the induction cooktops are best as the heat is produced inside the cooking pan’s base. Thus these consume less energy than the electric stoves and heat up quickly too. And the best part of induction cooktop is they are a breeze to clean. The ceramic or flat glass surface does not have any grills or gaps where food spills and is hard to remove. The induction top can be cleaned easily with a cloth. And the cooking is more precise and controlled with the power and time settings. With so many advantages do you wonder why it is not more commonly used? The reason is partly because of the comfort factor. People are more used to cooking on gas rings. But to counter this Samsung had recently launched a cooktop that has an LED light projection to indicate the stove is on and also the level of heating. Further the induction cooktops are expensive and the settings can be complex when compared to the gas stoves. Are you eager to buy one for your kitchen? You can find numerous induction models online and in the local stores available in different sizes, shapes and budget making it difficult to choose an appropriate one. We have made your job easier by choosing the 10 best induction cooktop models available now. Read on to know more. The search for the best induction cooktop is not a simple one. There are many things to consider including the size, the number of burners, the finish and design of the cooktop. Here are some additional but important factors to look into before you make the final decision on the best induction cooktop for you. Induction cooktops are as powerful or even better when compared to an electric or gas cooktop. The power capacity of the cooktops range from 1,400W to 3,700W in general. And a few advanced models offer power boost option that further increases the heating power. This enables you to heat up any dish including searing food or boiling water faster and with more powerful result. The expense may be a bit of drawback but the power boost is certainly a good option to consider. Induction cooktops are designed for use with minimum installation hassle. If you are considering a single cooktop, you need to have just countertop space and an electrical outlet of sufficient power nearby. It is only for the induction hobs that are two, three or four in number that you need cutout space for fitting the cooktop properly. All induction cooktop models are flat on top. You will not find any grate or coil over the surface that you have to remove or clean. The surface is mostly made of ceramic or glass. The line up in this post includes single cooktop induction models with touch controls for easy settings and temperature adjustments. Flat surface offers the benefit of cooking without any mess. Food cannot get logged in the coils or rings or drip pans. Cleaning is thus a breeze here. Moreover since the cooktop does not heatup, you will not have to slog every night scraping the burnt food from the stove. Even if the cooktop does not generate much heat ventilation is necessary to take care of the heat or hot air that is generated. You get the smoke, grease and odors even with the induction thus necessitating proper ventilation. The exhaust fans, ventilation hoods and range hoods are good options for dissipating the heat, grease and odor. A wider temperature range indicates a high capacity to keep warm on low ranges and on the higher levels bring on chef quality sear. 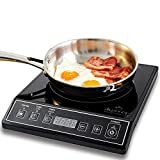 Best induction cooktop models are those that have more temperature increment choices as these indicate better cooking accuracy. The power feature has quick heat options such as boil, simmer or heat levels that increase from 1 to 10. This range makes cooking easier and convenient. But at the same time you have to know that induction cooks food faster, so ensure you don’t get distracted while using the induction as a pot can easily boil and spill over or the food you roast can burn in a matter of a few seconds. The auto shut off feature is an excellent feature that many users find beneficial and safe. The cooktop also features other safety options such as pause button, child locks, temperature gauges for internal and surface parts. And the cooktop does not heat food unless it comes in contact with a compatible cooking pan. The cooktop comes in different shapes and sizes. But it is very compact to use and does not take much of counter space. And the features are easy to understand and use so you will not have to keep the manual handy to look up for every type of cooking you venture into. · As the induction system transfers heat straight to the vessel, the surface of the cooktop does not heat up as it would in an electric or gas stovetop. So, there is minimal risk of getting burnt from coming into contact with the cooktop. This is particularly safe when you have active kids in your home. But when you have used the induction for a long time, it may be a bit warm so be careful. · The auto shut off mode is another safety feature that is very useful while cooking. So let us move on to the best induction cooktops that satisfy most or all the features we had outlined above. We have considered single burner cooktops of 30 inches wide for our line up. NuWave has some really outstanding features that make it a compact, convenient and robust cooktop. The most attractive feature in NuWave is its intuitive display. You can easily understand the options and features and start using it immediately. It has a temperature range starting from 100 degrees Fahrenheit to 575 degrees Fahrenheit. The cooking timer has nearly 99 hours and 60 minutes of programmable memory. Other important features to note in NuWave include programmable memory, light in weight, and least watts usage resulting in high energy savings, six different power modes, stylish look, reasonable price tag and temperature controls with 10 degree Fahrenheit increments. And most significant part of the cooktop is its high safety features. The back vents are extra-large in size making it easy for heat to escape leaving the cooktop cooler. The noise is not too loud when compared to other similar models in this lineup. The cooktop shuts off automatically when the internal temperature reaches 230 degrees Fahrenheit. You can easily increase and decrease the heat with the automatic timer feature. Duxtop won our approval with its notable power modes and diverse temperature range. Its ease of use is another stellar feature. Some of the features that make it the second best cooktop in our lineup include temperature range of 140 degrees Fahrenheit to 460 degrees Fahrenheit. It boiled water faster than other cooktops and cooled in just 39 minutes, while NuWave took 60 minutes to cool. The display is pleasing to the eye and easy to use with its ten basic power levels and cooking timer of 120 minutes. Although it lacks the advanced features of NuWave, it manages to hold its own with the basic features that are convenient, efficient and effective for cooking any type of food. Fagor stands out with its modern and sleek look. The touchpad is luxurious to look and feel. Other favorable features in the cooktop including a wide range of temperature starting from 140 degrees Fahrenheit to 465 degrees Fahrenheit and its quick launch buttons that make it easy to simmer, warm, sauté, brown or stir fry foods at a single touch. While it did take some time to heat up, it’s cool down time is pretty impressive at 31 minutes. The modern look, compact design, low cost, ease of use and high efficiency are important features that make it an irresistible option. 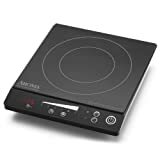 Duxtopis an easy and convenient cooktop that is designed compactly for easy storage. It does not have any raised touch sensors making cleaning a breeze.Another good feature in the Duxtop that drew our attention is its safety lock feature. You have to just press the lock and hold it for 3 seconds to lock and unlock it. The cooktop has an autoshut off time of 60 seconds which is very useful for saving power, if you forget to off the cooktop. And the cooktop has a high or low voltage warning that helps to protect it from voltage spikes. And in case of any fault in the cooktop, it will indicate an error signal. Thus Duxtop is a portable and stylish product that makes cooking and cleaning a breeze. Max Burton 6400 is a trendy looking cooktop with superior functionality. When compared to the other popular cooktops, it is very light in weight weighing just 7.8 pounds. The black cooktop surface with stainless steel border gives it an attractive appearance. LCD display, multi-touch modes, sloping control panel, temperature settings ranging from 100 degrees Fahrenheit to 450 degrees Fahrenheit and timer programmable up to 180 degrees are some of the efficient and useful features the cooktop boasts of. With good temperature controls that are easy to adjust for daily cooking needs, easy storage design and convenient to use, the cooktop is a favorite among users. Waring Pro is a user friendly cooktop with high energy efficiency. This is the most affordable in our lineup. It is a lightweight cooktop with simple design and basic functionalities. It has 8 different power control modes, a power on and off button, timer function and is programmed for heating to a maximum temperature of 180 minutes. The lack of temperature mode may be a handicap for cooking foods that need temperature setting but can be handled by just adjusting power mode to a high or low setting as needed. With a power capacity of 1600 Watts, the cooktop has good ventilation and sensors that shut off the stove when the temperature exceeds the normal limits. It also has an automatic shut down after 30 seconds of removing the cooking pan from the cooktop, or if there is no activity identified. 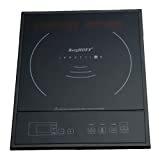 If you are in search of a low budget induction cooktop with warm mode feature, the Aroma AID-509 is a good choice. It has a timer that can be set to about 180 minutes maximum. After the timer goes off, the unit will switch over to keep warm mode as present in many electric rice cooker models. The digital keys are intuitive and controls are easy to use. The unit is very energy efficient consuming nearly 70% less energy than conventional cooktops. The power setting ranges from 120 W minimum to 1500 W maximum with 6 levels of heat setting. This allows you to boil water quickly at the maximum level and keep cooked food warm at the lowest heating level. The only drawback with the unit is it is not possible to choose the temperature level. You have to use the power settings to understand the corresponding temperature and set it. With a weight of 5.7 pounds and a dimension of 12 inches x 15 inches x 2 ½ inches, True Induction P3D is a very compact induction cooktop with a power of 1600Watts. It has integrated controls, smooth ceramic surface that is easy to clean and a control panel with 10 setting levels that enable setting of temperature from 150 degrees Fahrenheit to 450 degrees Fahrenheit. Inbuilt controls allow you to set the cooking temperature and time and you can happily go and finish your other chores. The warning beep will signal that the cooking is done without having to stand nearby until the cooking is over. The unit has two sensors – one for position of pot and the other for recognition of the pot. Thus the system will start to heat only when the right type of cookware is placed in the right spot on the cooktop, which has a coil of 6 inches under its cooking surface. The Berghoff induction cooktop is a basic induction cooktop that has the most essential buttons on its control panel. Even novices who are wary of complex cooking menus can easily use the cooktop. Control panel is placed in such a way that there is no risk of accidentally touching the controls while using the cooktop. The controls provided include power on and off, temperature, heat, timer, and +/- adjusting keys. The timer can be set to a maximum of 150 minutes and the increments are of 5 minute duration. The cooktop has 5 heat levels and an LED display for viewing all cooking settings including the error codes. The Caso cooktop has several advanced performance features and made of high quality material and stylish design. The control panel part is silver in hue while the cooking surface retains the black color seen in most cooktops. Control panel features a rotating knob for adjusting the temperature, heat and time. While the unit has a low power capacity of 1500 W, when compared to models that have about 1800W as the maximum setting, its innovative features compensate amply for the lack. The LED display has middle numbers appearing blue in color, which provides an appealing look to the unit. Temperature settings are between 160 and 430 degrees Fahrenheit. The power includes 10 different levels. Automatic sensors for pan detection and overheating are present in this model. 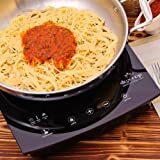 The compatible cookware to be used on this cooktop includes all pans and pots with magnetic base. Cooking food generally involves generating a large amount of heat and enables easy transfer of the heat to the cooking vessel. While early man used open fire for heat generation, nowadays two main methods are used namely, electrical and chemical. The energy needed for heat production is produced by heating substances like gas, coal or wood or by passing electric current via resistance element present inside a coil or inside a bulb filled with halogen. Microwave oven cooking is the fourth cooking method where heat generation occurs directly inside the food. What is the mechanism behind induction cooking? The cooking element in an induction cooktop is made of an electromagnet of high frequency. Advanced electronics inbuilt inside the unit helps generate electromagnetism. The electronics in the element provides power for the coil. This creates an electromagnetic field of high frequency. This field passes via the ferrous metal present in the cooking pan. The heat thus generated gets transferred to the contents of the vessel. When you use a magnetic material like cast iron pan, the element generated magnetic field transfers energy to the metal. This heats up the vessel. The heat generated can be controlled by modifying the electromagnetic field’s strength. This can be done instantly. In technical terms, the magnetic field creates a current loop inside the cooking pan. Heat is generated by the flow of current via the metal’s resistance. This is similar to how the coil in a conventional electric range gets heated by current flow. The only difference is that in an induction system, the heat generation occurs in the pan or pot and not in the cooktop. The magnetic field’s effect is present only inside the vessel and does not affect any other space outside the vessel. When you remove the vessel from the cooktop or switch off the power, the generation of heat stops. The heat generation also occurs by hysteresis. This is a method where the rapid magnetization changes produces resistance in the ferrous metal causing heat production. Can I use aluminum and copper vessels for cooking in the induction stove? Since induction works based on electromagnetic principle, it is important that the vessels you use for cooking should be of iron or a metal with ferrous in it. As you know all substances are made of atoms. Each atom has a nucleus made of protons and neutrons which is surrounded by electrons. Electrons possess a spin property which makes them take on magnetic property. So, based on their position around an atom’s nucleus, the electrons spin either in upward or downward direction. In case of ferrous particles the electrons are unbalanced. The up and down spinning electrons are not equal in number. Thus they gain magnetic properties and are controllable by magnetic fields. The crystalline structure of the ferrous material also augments the magnetic effect. In case of materials other than ferrous such as zinc and aluminum the electrons present are well balanced. In other words, the upward spin is equal to the downward spinning electron. Thus these metals are not under magnetic field influence like the ferrous metal. The magnetic field forms just tiny eddy currents, which is not sufficient to heat the metal. Hence vessels made of copper, ceramic, pyrex and aluminum cannot be used on the cooktop. Only pans and pots made of steel or iron work well on the cooktop. This is not a drawback as you get quite a wide range of cookware in different shapes and sizes made just for cooking on an induction cooker. And there are vessels made of aluminum and other non- ferrous materials that have induction disks fitted to the base to enable use on an induction cooktop. Vessels made of pyrex, ceramic pot or glass can be used on induction when such disks are present on the base. But the vital benefits of using induction such as high energy efficiency and no wastage of heat will not be as pronounced in such vessels. Is induction better than electric and gas stove tops? When you compare the different types of cooktops, it is the gas stove tops that are preferred by professional chefs as well as homemakers. This is because the fire produces heat instantly and also reacts fast. The electric stovetops are the least preferred because they are slow to heat due to the coil taking time for heating up. And the electric coils also take more time to lose the heat, so you will not have good control of whatever you are cooking. Induction on the other hand has the best properties of the above two methods, as it gives the instant heat reaction mainly due to the electromagnetic property that connects the vessel to the pot. Moreover you will not have to be concerned about working with an open fire. With respect to efficient use of energy, gas flame is the least energy efficient as nearly 60% of the heat from the flame is wasted. In a poorly ventilated kitchen, the heat will not dissipate and result in raised air temperature inside the kitchen. Hence the efficiency may be partially improved, if the kitchen has good ventilation. 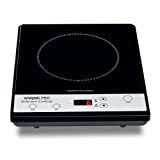 In case of electric cooktops, the use of heat energy is more efficient than induction, if the vessel used covers the coil diameter completely. But the induction method is considered the most energy efficient because the heat is created in the cookware directly. It does not have a coil that has to heat up first as in an electric stove or an open flame as in gas stove that needs oxygen and air for heat transfer. In this aspect the induction is far superior and efficient than the other two methods. This is also the reason why it is more accurate and fast than the gas or electric cooking systems. How does induction cook food faster? The induction cooktop is made of an outer ceramic layer and a coil of electromagnetic property under the plate. When the power is switched on, the current activates magnetic field without heating up the burner. The food is cooked by the contact of the stainless steel or iron pan with the electromagnetic field. Small electric currents are created in the metal of the pan. Since iron is not a good conductor of electricity, the currents passing through it are converted to heat. Hence the food gets heated in the pan not due to the heat from the burner but from the pan. This is why the food is cooked faster than in a gas stove where much of the heat is dispersed off before it reaches the pan. There is also minimal chance of hot spots in the pan, so food will not get burned due to uneven heating. Moreover cooling off is faster with induction as the heat is cut off once you remove the cooking pan from the induction cooktop. However induction cooktop has a drawback. It works only with pans made of iron and not those made of aluminum or copper. Generally any material that sticks to a magnet can be used on an induction cooktop. Does induction have more power than a gas stove? Gas stoves of the highest power for residential use range around 22,000 BTU per hour. Induction cooktops even the budget picks have a power capacity of 3.7 kW, which is equivalent to 26,500 BTU per hour. And this can further be increased to higher levels, if you are heating a bigger sized vessel or deep frying foods. But you have to understand that for routine cooking you do not need such high power capacities. So it is not a good idea to choose an induction cooktop based on its maximum power capacity. In general most of the units available in the market of similar size have identical power capacities. The difference is found in the way the power is distributed in the element of the unit. For a unit that is 30 inches wide there are four, while it is five in a unit that is 36 inches wide. Therefore a high power should not be the vital influencing factor for your purchase decision. · Instant heating: With induction cooktops you can be assured of instant heating. When you heat up water using an induction, it comes to a boil faster than when you use a gas stove or electric stove. · No waste of heat energy: The induction technology enables heating food without wasting it in any way. Since heat is created inside the cooking pan and not on the surface the induction method can save nearly 70% heat energy, when compared to a gas or electric stove. · Safe cooking: As cooking involves heat, safety is a priority that should not be ignored. Induction is very satisfactory in this aspect. It can be used safely when you have kids in the house. The auto shut off feature enables the stove to switch off immediately after removing the pan from the cooktop. And the surface of the cooktop does not heat up, so you can touch it after switching it off without fear of getting burnt. · Easy clean: Cleaning is by far the most feared task when it comes to gas stoves and other cooktops. Induction is very convenient in this aspect as the surface is smooth and flat without any crevices or nooks where food can get lodged and burnt making it difficult to remove. Food that spills on the surface does not get baked as the surface does not heat up. Cleaning is also easy as you just need to use a wet towel and wipe off the ceramic glass top. · Stylish design: Induction cooktops have one thing in common and that is their stylish design. The ceramic cooktop surfaces are shiny and easy to maintain making them a great addition to the kitchen. Further the rectangular, square and rounded shapes add an elegant touch and also help to accommodate them better. The can easily blend with your kitchen décor. · Kitchen stays cool: With induction, the kitchen remains cool as there is no heat dissipation from the cooktop. Since the temperature is low, ventilation needed for expelling hot air is minimized. In huge restaurant kitchens or galley kitchens this is very handy and also helps avoid the stifling heat that you experience with gas stove cooking. Although induction cooktops have several beneficial features in relation to design, power and functions they have their own disadvantages. û The cost is very prohibitive as it is more than what a conventional gas or electric stove would cost. However since it is very energy efficient you will save more on energy bills. û Finding the right cookware can be a bit difficult. You may have to buy a new set of induction cookware, if you don’t have them already. But if you just ensure that a magnet is present in the base of the cookware, you can easily use the stove and reap its benefits. û Power in the induction can be a drawback. You have to depend on electricity for using the induction. In case of power outages, you cannot use it which is not the case with gas stoves. û When you purchase an induction model with two burners or more the total power provided and the power to each burner will differ. For instance, if you buy an induction cooktop with two burners of 1800 W power, each of the burners will have only 900W power. But some of the manufacturers have addressed this issue so it is not much of a drawback now. In European, Australian and Asian markets, induction cooktops are very popular. However in the USA, it is not that prevalent. But this trend is changing now due to the various diverse models and innovative designs that are available in induction cooktops and cooking pans. While using an induction for the first time you may find it difficult to adjust to the different temperature, heat and time controls. Here are a few tips to help you use it efficiently. · If you want to boil first and then simmer it can be done easily with the induction. The control pad allows you to change the heat as and when you want. The controls are easy to understand and if in doubt use the instruction manual. · It is best to use cookware made particularly for induction. Check the existing pans and pots for their suitability. Pans, made of stainless steel and iron, are ideal. · If food spills onto the cooktop surface, clean it immediately otherwise it can burn on the surface. · Never leave food on cooktop unattended. · Do not arrange pan on the cooktop surface away from the element. This will cause only part of the food to be cooked. · Be careful while using sharp utensils. Dropping sharp utensils on the cooktop can damage the surface. · Avoid placing metallic utensils while the surface is hot as the metal can heat up and cause burns when you touch it. Since the surface is made of sturdy and smooth ceramic, the cooktops are a breeze to clean. The absence of dirt traps make cleaning quick and easy. Since touch sensitive controls are present, you do not have greasy knobs to clean. And majority of foods do not bake when the spill on the surface except with substances like sugar. With an induction cooktop, you can experience smart cooking capabilities. The cooktop can detect when a pan dries up and shuts off automatically. If you place an incompatible pan on the cooktop it will immediately display the error code and will not heat the pan. As you can see induction is a fast and powerful cooking method that produces minimal residual heat requiring less venting. It is also the safest of the various cooking methods as it requires activation by metal. Further it is a breeze to clean making it the most favorite cooking medium. Our best pickNuWave PIC2 is one of the best induction cooktop models available that meets with all the criteria that you need for an ideal induction cooktop. It is stylish, provides great performance capability and is reasonably priced.